This isn't a glass. It is a work of art. If you're searching for a handmade item you can buy online that is truly created by an artist, you've found the right item. Matthew Cummings makes (hand blown glass) all of the glasses by hand. No machines have touched your product when you buy from the Pretentious Beer Glass Co. Picking just one of his products is too hard. We ultimately went with the classic "Dual Beer Glass," but please explore his other creations. Why did we pick this glass over the mustache Ale Glass, the Malty Beer Glass, or the Hoppy Beer Glass? Well, first off, tradition -- this was the first specialty glass ever released by the PBGC. This cylindrical beer glass has two separate chambers inside. The chambers merge into one glass near the lip. 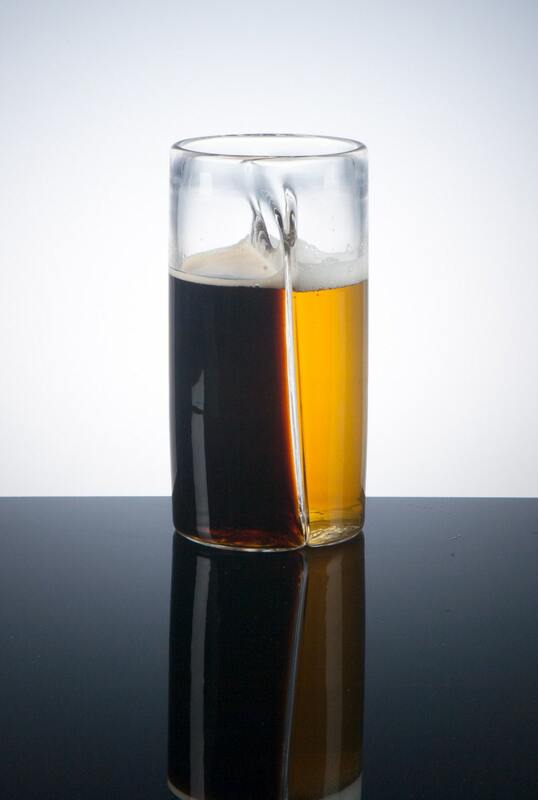 This is THE glass for beer connoisseurs who wish to perfectly blend two beers together. You just need to add a bow! Because each glass from PBGC is packaged in a gift box with a description card, all you'll need to do is add a bow! The card includes recommended beer pairings and information about the glass design. The video below gives a small glimpse into the art of glass blowing. You'll never look at your dual beer glass the same way again. Please, please, watch this video. It will blow your mind to the process and thought that went into the glass. You can visit PBGC vis their website.